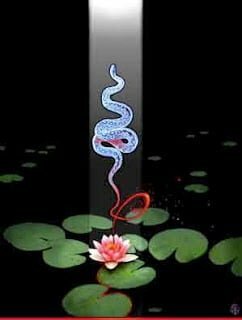 Ashlesha is signified by a coiled snake as the Nakshatra is ruled by Naga, the serpent god in Jyotish. Kundalini energy is associated with this, the ninth Nakshatra. This birth star resides solely in Cancer where Naga is immortalized by 3 stars in the crab’s southern claw. Highly revered during Vedic times, the serpent is associated with wisdom and Kundalini energy. Practitioners of Kundalini yoga practitioners seek enlightenment through the cultivation of this energy. These are piercing and severe people. They are known to have small, intense eyes and a trademark ‘look’. With their ‘look’ they can communicate a lot. You might be hypnotized, or feel like you’ve been punched in the stomach. You’ll know the ‘look’ when it hits you! 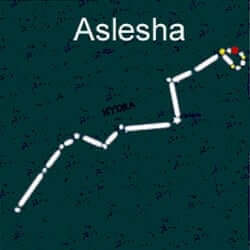 From the Nakshatra’s residence in Cancer’s claw and its component the “Clinging Star” it is implied that the Ashle`sha may squeeze the life out of their friends and relations. Highly intelligent, they can also be mean and devious. They make rash judgements and are prone to explosive fits of anger. Like their symbol the crab, they seem cold blooded and indifferent. This is one of their survival strategies. The Ashlesha native is very sensitive and like the crab’s shell, their emotions are easily shattered. Their fragile nature leaves them unable to deal with any sort of negative input. They may be deep-thinking people that carry a great deal of wisdom. However, imbalances may result in situations where they use their insight to control others. They are known to use their sexuality as a tool in their efforts to direct and manipulate such circumstances. Their highly emotional nature is disguised behind tough appearances and burly body type. Utterly lacking in gratitude, the Ashlesha native takes a rough and tough approach to life. They must be mindful not to alienate friends and family with their harsh approach. Strong-willed, they live in a black and white world with little room for flexibility. Somewhat magnetic creatures, others are drawn to the Ashlesha and they exhibit strong leadership qualities. Easily threatened, these people are quick to retreat and there inability to trust makes it difficult for associates to know the truth about who they are working with. An insatiable desire for power is inherent to many the Ashlesha and they may compromise themselves in order to achieve their goals. Their ambition and sense of loyalty can prove detrimental to them as they are led illegal and illicit pathways. This Vedic astrology Nakshatra is prevalent among those in politics and racketeering, as well as gamblers, murderers and thieves. Often misguided, charitable efforts will be fruitless for the intended beneficiaries and the Ashlesha will benefit in many ways. Generally lucky and known for being in the right place at the right time, the native Ashlesha is capable of achieving much success as long as they control their temper. Known for their skill in writing, Ashlesha’s are drawn to literature, astrology, politics and criminal activities. Natives of Ashlesha tend to have difficult relationships with their family. Their lack of compassion and inability to compromise makes marriage a challenge. They are known to take on more than their share of familial obligation, this may contribute to the challenges they experience in this area of their lives. Their inflexible approach to life leaves them wanting for peace of mind as they fight to maintain their rigid beliefs. They tend to hold their stress in their stomach and intestines and are prone to heartburn and flatulence. They may experience inexplicable leg pain and be prone to liver problems. Many Ashlesha also struggle with addiction.